I was tagged by Patti from Late Bloomer Boomer who was tagged by Sarah from Sarah's Cucina Bella to do this meme and being that it is quick and easy and I need something quick and easy before I leave for work in a little bit I decided to jump right in and do it today. 2. Share five random and/or weird facts about yourself on your blog. 3. Share the five top places on your “want to see or want to see again” list. 4. Tag a minimum of five random people at the end of your post and include links to their blogs. Let each person know that they have been tagged by leaving a comment in their blog. 1. Obviously, as stated above, I was tagged by Patti! I will not sleep in a room with an open closet door due to a great fear that I contracted as a child in a house in Tuscon, Arizona that I swear to this day was haunted and there is no convincing me otherwise. I graduated from high school in 1976, the year our country celebrated its bicentennial and I have the red, white, and blue tassel to prove it! I collect elephants and angels and tea pots. I got braces when I was over 40 years old because I couldn't stand my crooked bottom teeth anymore. I am scared of clowns, heights, and snakes - not necessarily in that order! 3. The Top Five places on my “want to see or want to see again” list. Gee, I didn't know I had one of those but I'll come up with one now! London, England - ah, the history! Lake Tahoe - ah, the memories! The Grand Canyon - ah, the geology! Yosemite National Park - ah, the majesty! Rome, Italy - ah, the statuary! Empress Bee of the High Sea - because she hasn't been tagged in awhile that I know of! Sarge Charlie - because he's just so doggone cute and Miss Bee loves him to pieces! CrAzY Working Mom - because Tisha is just such a sweetheart! 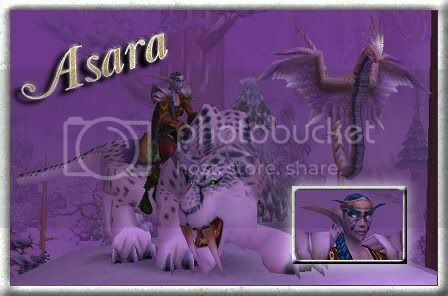 Asara's Mental Meanderings - because Carrie does that whole World of Warcraft thing and her answers should be really cool! My Dogs Keep Me Sane - because Misty Dawn is just as much of a sweetheart as Tisha is and maybe she could get one of her dogs to write the post because they're pretty doggone cute, too! There - that was quick, that was easy, and it was fun. Now I can go to work and watch the Super Bowl tonight so as not to miss any of the commercials (game? they play a game in between the commericals?) and maybe even help safe a life or two! i will think about it honey, haven't done any in quite a while, i got burned out on them for awhile. OH Linda, what a nice little post. I got braces after I got divorced at 35 years old. Wow,,, weird wasn't it. I love your list of places to go. Well, I guess tomorrow we can talk about which commercials we liked since it is Super Bull Sunday. Love ya Girl!!!! You know, what you really need is to find a teapot shaped like an elephant angel. Then you'll have added to all three collections at one time! Me, sweet??? Awww shucks...you're too kind! Gotta go, commercials are on! I used to collect teapots if I only knew you when I started to give away my collection. And the bicentennial what fun that was! We painted our sidewalk, street light base and curb red, white and blue. The city allowed it for that year. Memories! It is all "5" here, there are five comments before me ....LOL..
Scared of clowns? Now I bet that's a really interesting story for a future post. Bravo, Linda! that was fun to read. I also am afraid of clowns. They are not the least bit funny to me. Huh! "not necessarily in that order' = you silly sausage!